That’s the Carthage mission. It’s not a stodgy old saying recited at alumni banquets and presidential dinners. It’s a challenge. One that we put forth anew every single day. To our students. To our faculty and staff. To make this world a better place for all of us. Carthage is a college of the Evangelical Lutheran Church in America, espousing and expressing the Judeo-Christian tradition. Carthage honors God’s love for all people and celebrates the rich diversity of creation. Carthage embraces scholarship and teaching that are grounded in respect for truth, the possibilities and limitations of individual perspectives, and personal accountability. Carthage recognizes that the quest for Truth is a life-long journey and that knowledge, experience, and understanding, gained through a love of learning, are the surest guides. Carthage promotes personal, professional, and social relationships characterized by truth, honesty, and integrity. Carthage challenges all members of the community to seek excellence in every endeavor. Carthage provides the resources, tools, and facilities necessary to attract and develop committed students, faculty, staff, and trustees. Carthage strives for robustness throughout its educational experience, providing students with opportunities to grow in all facets of life. Carthage seeks breadth and depth of cultural experience from faculty and students, building a foundation for informed, courageous, and effective action in the larger world. Carthage collaborates with advisors and partners who help increase the relevance, vibrancy, and resilience of the educational experience. Carthage is a responsible steward, investing in and preserving resources in service to current and successive generations of students. Carthage affirms that the privilege of education is accompanied by the responsibilities of social awareness. Carthage challenges students to become builders of a just and compassionate world by immersing them in an educational experience that offers exposure to the full breadth of existence on Earth. Carthage prepares students for lives of service, and progression to leadership, by providing opportunities to give of themselves and help others—locally, nationally, and internationally. Carthage models and promotes the art of stewardship, enjoining respect for life in all of its various forms and cultures. Carthage is a college community that spans generations and bridges ideologies, nurturing lives of service, work, appreciation, and understanding. Carthage affirms that Truth, Strength, and Service intertwine beneficially throughout life, and encourages members of the community to follow paths that incorporate all three. Carthage embraces traditions that lift up the community and increase its relevance and prestige. Carthage encourages community members to challenge and support one another, to accept responsibility and require accountability, and to collaborate in serving the best interest of students. 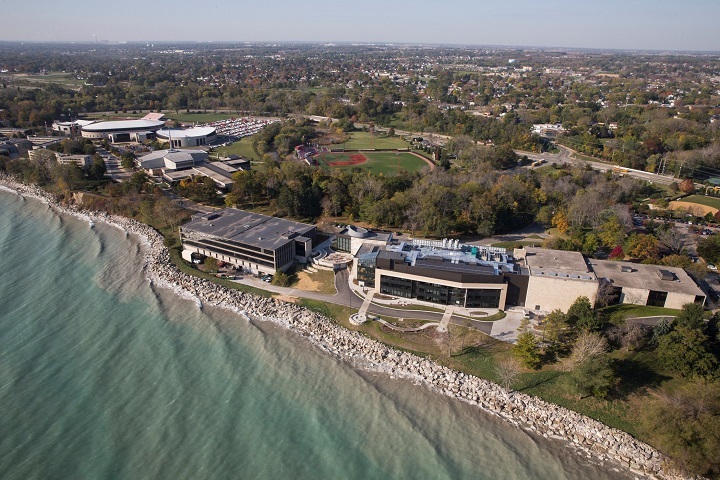 Carthage’s campus is an 80-acre arboretum located on the shore of Lake Michigan, midway between Chicago and Milwaukee. 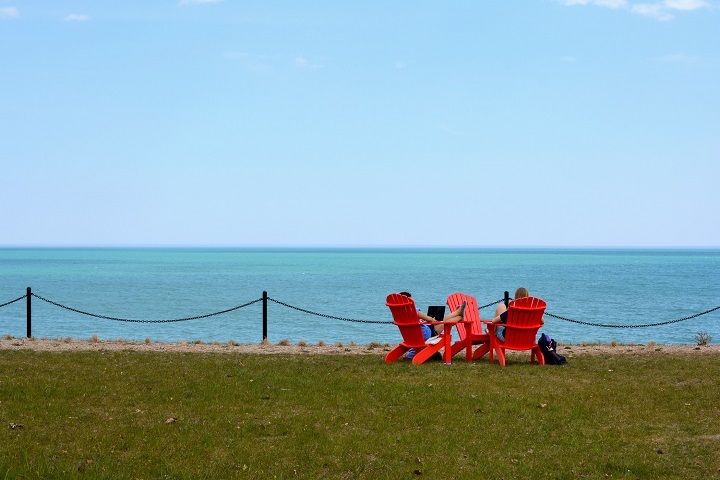 The campus offers breathtaking views of Lake Michigan from almost every building on campus, including many residence hall rooms. Easy access to two major metropolitan areas gives students opportunities for real-world experience and networking. Carthage is home to 2,600 full-time undergraduate students and 400 part-time students. Our average class size is just 17 students. Carthage’s student-to-faculty ratio is 12:1. Carthage awards the Bachelor of Arts degree with majors in more than 40 subject areas, the Bachelor of Science in Nursing degree, a Master of Education degree, and a Master of Science in Business Design and Innovation degree. Carthage also hosts the Loyola University Chicago Master of Social Work graduate degree program. Carthage offers majors, minors, and concentrations in more than 50 areas of study, including biology, finance, international political economy, education, theatre, and neuroscience. We emphasize interdisciplinary study, undergraduate research, hands-on learning, individual attention, and vibrant discussion and debate in the classroom. The curriculum is designed to promote critical thinking while challenging students to express themselves effectively. Carthage seniors score in the top 11 percent nationally in critical thinking, problem-solving, and written communication; the academic gains shown by Carthage students from their freshman to senior year are in the top 17 percent nationally. Carthage has been accredited by the Higher Learning Commission since 1916. Carthage has been named a Best Midwestern College by The Princeton Review (2016), a designation given to only 25 percent of four-year schools. Professors, not teaching assistants, teach all classes. Our devoted faculty comprises more than 150 scholars, 90 percent of whom hold doctorate or terminal degrees from the world’s top graduate schools including Harvard, Yale, MIT, Princeton, and Oxford. Student life at Carthage will be a monumental part of your experience. 70 percent of students live on campus; students are required to live on campus until their senior year, and on-campus housing is guaranteed for all four years. Kenosha is a vibrant area with art galleries, museums, theatres, shopping, and restaurants; Milwaukee and Chicago are just a quick trip away. On campus, there is always something going on: plays, lectures, movies, visiting performers, 5K runs. Tarble Arena has hosted the Script, the Fray, and Phillip Phillips, among others. With more than 120 student organizations, there are plenty of ways to get involved. A college education should do more than just get you a job. It should help you discover who you are, what you were created to do, and how you can work for the greater good. Carthage is affiliated with the Evangelical Lutheran Church in America, but just because we’re Lutheran doesn’t mean you need to be. We share and welcome opinions, experiences, and stories of faith from religions around the world. Our Lutheran values mean we challenge you to ask the heavy questions and strive to help our students develop a strong moral and intellectual compass. Things look new at Carthage because they are. Carthage has invested more than $200 million in campus facilities in the past 12 years. A brand new science center opened in Fall 2015. Other new buildings include the Campbell Student Union, the Oaks Residential Village, N. E. Tarble Athletic, and Recreation Center, and A. W. Clausen Center for World Business. Carthage fields 24 NCAA Division III teams competing in the College Conference of Illinois and Wisconsin. About a third of our student body participates in varsity intercollegiate athletics, and another third participates in the many intramural and club sports offered. Carthage is ranked No. 5 in the nation among baccalaureate institutions for student participation in short-term student abroad. Many students who wouldn’t otherwise study abroad during college have an opportunity to spend up to a month in a different country during Carthage’s January Term, when faculty leads study tours to such destinations as Germany, Sweden, Cuba, China, and Nicaragua. At Carthage, we’ve seen 170 years of leaders, makers, and go-getters go out and go forth. We’ve changed our name — and even our location — since we were founded in 1847. But the core of a Carthage education has stayed the same: Our liberal arts foundation provides students with a strong academic, moral, and intellectual compass, so they become perceptive, resourceful, and grounded individuals. Carthage College was founded by Lutheran pioneers in education, and chartered by the Illinois General Assembly on Jan. 22, 1847. Back then, the College was located in Hillsboro, Ill., and was known as The Literary and Theological Institute of the Lutheran Church in the Far West. The name was soon shortened to Hillsboro College. Hillsboro prospered in its first two years, thanks to support from Lutheran congregations. In 1852, the College relocated to the larger town of Springfield, Ill., and assumed the new name of Illinois State University. In 1870, the College moved again, this time to the rural, west-central city of Carthage, Ill., where the College acquired its current name. By 1916, the College gained accreditation from the North Central Association of Colleges and Secondary Schools and received the association’s highest rating of “A” — one of only four colleges in Illinois to gain this honor. By 1927, enrollment in the College had reached nearly 300 students. The Great Depression and World War II lowered enrollment to 131 students in 1943. Ten years later, the Board of Trustees agreed to consider relocating Carthage once again. By 1962, Carthage had established its lakeshore campus in Kenosha, Wis., and the College launched an era of exciting growth. The next decade brought a period of continuous expansion. Enrollment increased fivefold, the endowment tripled, and physical assets increased 600 percent. In Fall 1995, Carthage enrolled 1,527 full-time students, setting a new record. Full-time enrollment now stands at a record level of 2,600 students. Total enrollment is 3,000 students. Intensive national searches have built a teaching-oriented faculty holding Ph.D.s from major graduate programs across the country. Since 1999, Carthage has invested more than $250 million in new construction, major renovations, and technological acquisition.